Sagan: Dude, what are you doing 40 minute back and not even wearing the green sprint jersey? To go from yellow to so far back in basically a single day… It’s like you’re not even competing. I don’t get it. 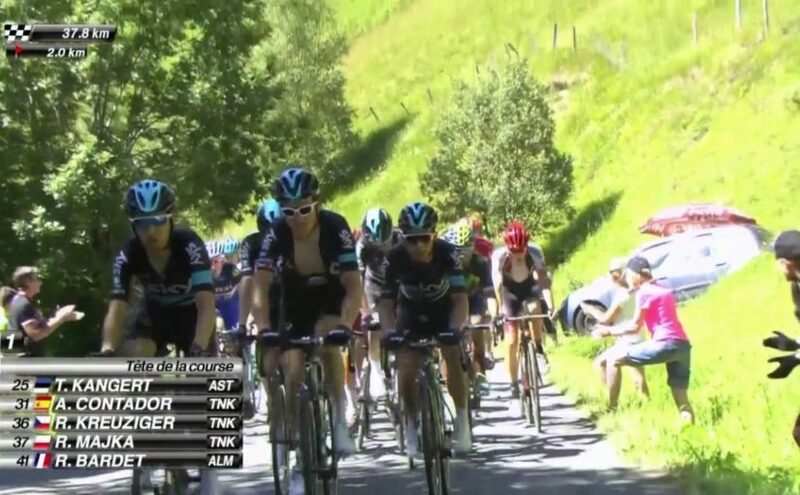 Great job Teejay to be right in the same spot as Froome and Nibali and Quintana at about 23 seconds back. Please don’t screw this up, ok? NBC: It’s sad you can’t even start your live stream in time to see the climb of the Tourmelet on today’s stage 8, but worse you can’t even include a single mention of the highest-placed American rider in your coverage? Ever? If I wasn’t paying particular attention your coverage would lead me to believe there are no Americans in position for GC contention at this point and that’s just not the case. I understand the European coverage doesn’t care about American riders, but those of us in the US who pay $30 every summer for your coverage most likely do. It was kind of Chris Froome and Team Sky to give us a nice week of racing where they didn’t dominate completely. It would have been nice if they would have waited another week to allow us to continue enjoying the fantasy that, maybe, maybe, someone else might have a chance of winning this year, but I guess that would be too much to ask. Do blogrolls even exist anymore? Are they a thing? I remember the day there was this awesome new blog toy called blogrolling.com. It was this cool site where you could collect links that you wanted to include on your blog and then you put a little code into your blog’s sidebar and, voila! Instant blogroll! I loved it. That was the kind of geek I was back in… 2003? But time is accelerated on the internet. Blogs were a new thing then and now they are old things that no one has or maintains anymore. They have been taken over by corporations and talking heads. Maybe it’s not just blogrolls that have gone extinct, but blogs themselves. Is anyone out there? But, yes, of course there are blogs out there, as the blogroll, or link list, in the sidebar of this blog here will attest. Some of the links there are dead, or lead to places that have grown dusty and disused. Some of those links (ok, most of them) I haven’t even visited in years. But it’s fun to revisit old haunts, to see what’s still out there, alive and kicking, and what has gone dormant or slipped away into the internet aether. Hello, Blonde Justice, so nice to see you again, or still — since 2004!?! I am amazed and impressed. In awe, really. Also, not only is she still there, but still hitting it out of the park with great posts that capture what it means to be a public defender. And Skelly So great. I look forward to going through the blogroll again, saying hello to old friends, getting reacquainted, finding new links, and to letting you know what I find. How The New York Times Magazine’s recent ‘walking issue’ cover was made. @ It wasn’t Photoshop! It’s been a long time. Apparently it’s been five years. That’s long enough for a lot of hackers and spammers to have trashed the installation of WordPress this site runs on because I wasn’t actively keeping it up to date. One of the drawbacks of setting up your own blog back in the dark ages of blogging was that you had to do so much of it yourself. At the time (way back in 2002! ), I had time to maintain a web server and make sure the code stayed up to date. How things have changed! So much has changed that I don’t even know where to begin, so I will just begin with this: Hello again. I’ve missed you. Let’s start again, shall we?